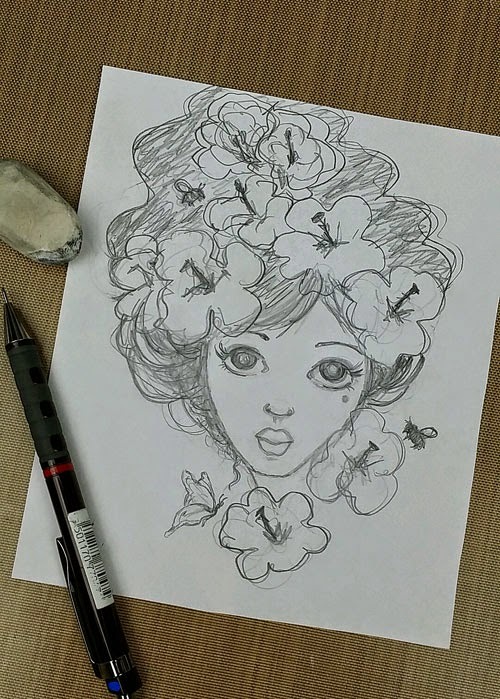 What do you do when a ladybird fairy lands in your flower garden? Invite her in for tea of course! 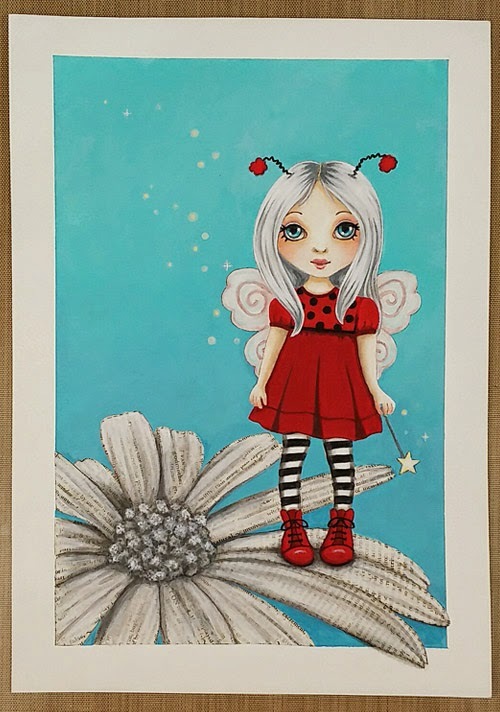 I did a digital version of this cutie a couple of years ago and what with a special little granddaughter's 1st birthday coming up I wanted to see what she would look like as a mixed media collage piece. 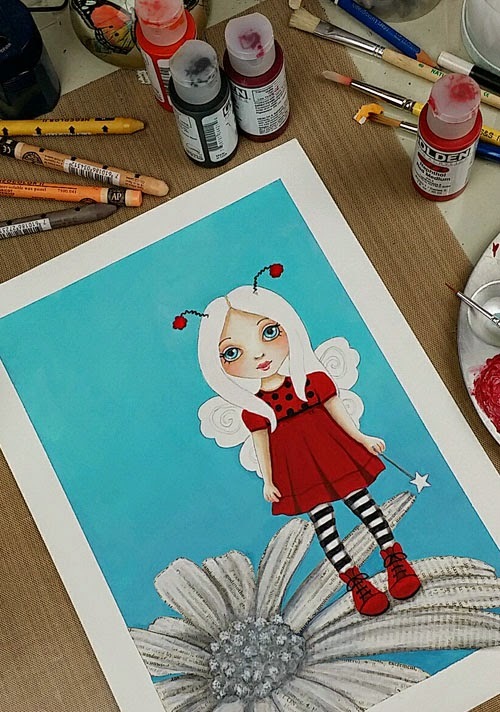 My original inspiration was a little wooden doll I made in the first year of Life Book with red boots, striped black and white stockings in a black tutu! Also I have been making ladybird embellishments for my scrapbook pages. I have always considered myself to be an art and craft gal at heart. I really want to complete a couple of my albums, so that has taken up my time recently. A couple of new gadgets have made it really fun. 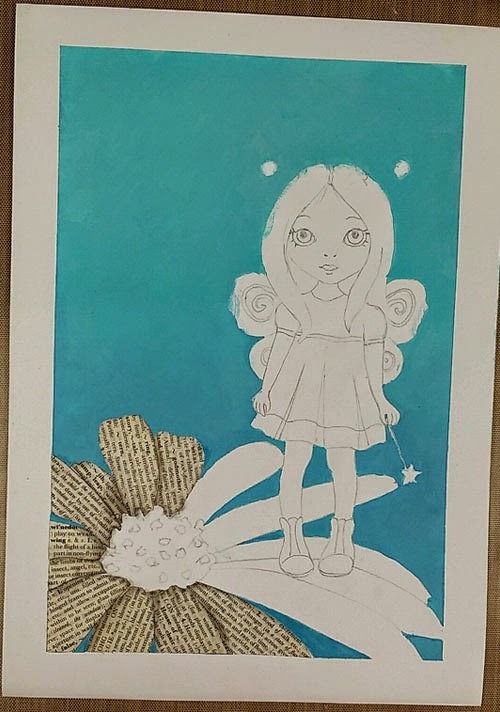 Once the image of the fairy and flower were drawn onto the 140lb hot pressed watercolour paper, I masked the four sides of the image with low tack tape to give a nice crisp edge. 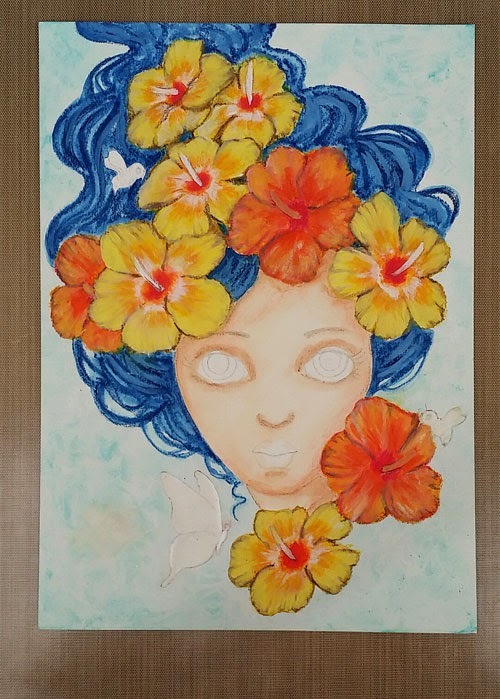 I applied shades of teal acrylic paint to block in the background colour in a soft gradient. I could have included lots of texture here but my vision for this piece was a clean cut look with the two main elements as the focal points. After carefully peeling off the low tack tape, the petals of the flower were cut out from old dictionary pages and glued down. Thin washes of gesso and detail colour gave the flower added depth with the print of the pages still coming through for added interest. 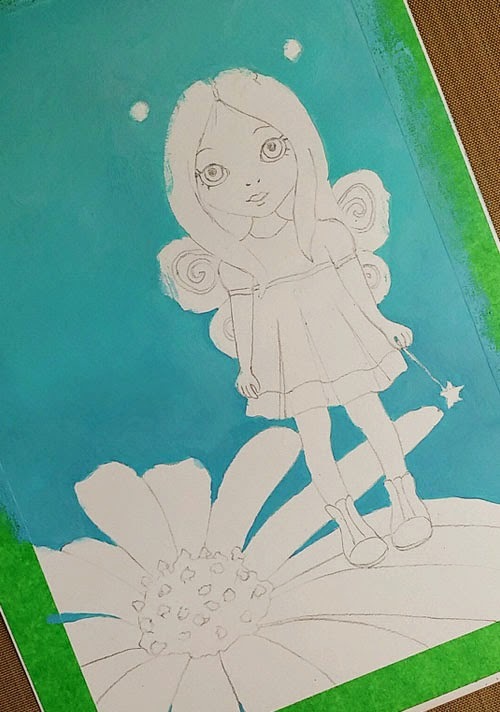 Undiluted Gesso was applied to the fairy's hair, wings and wand as a good clean base before painting. 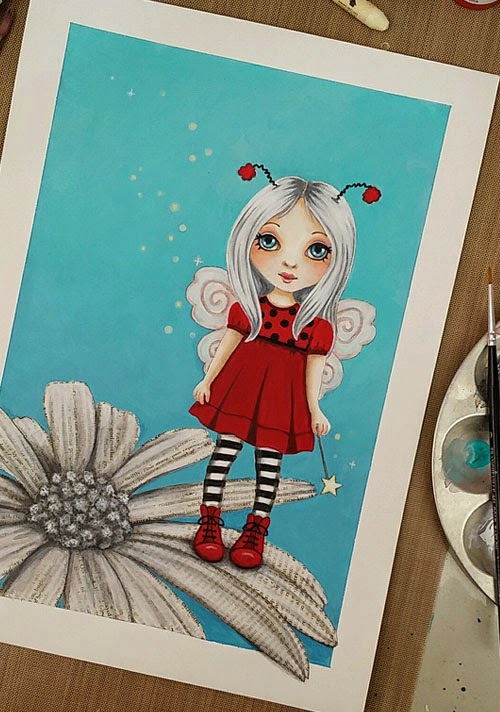 Layer by layer acrylic paint and watersoluble crayons bring the ladybird fairy to life. At this point I reassess everything and correct some tones and highlights in the areas that need it. 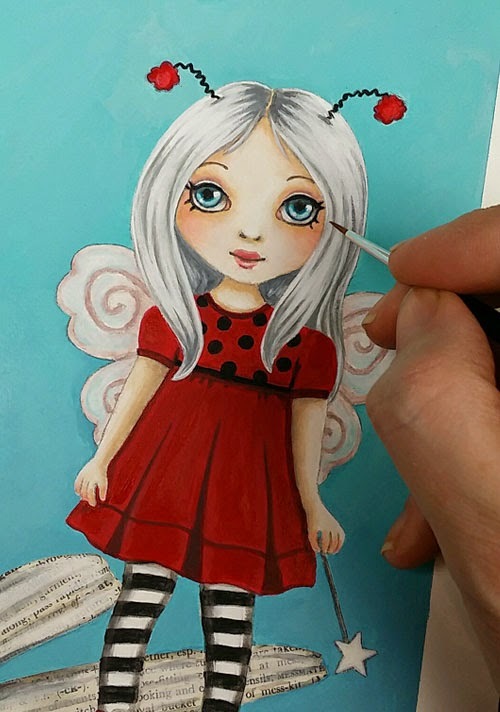 After a delightful tea and chat, it was time to wave the ladybird fairy on her way.I love how this mixed media version turned out and hope you do too. 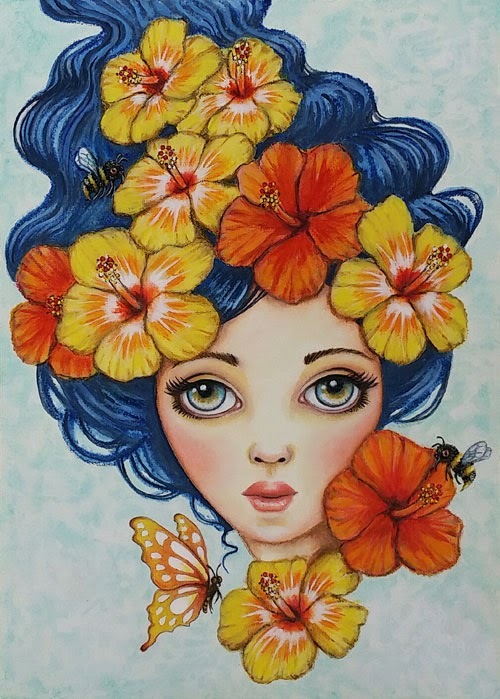 "Flora" the goddess of plants and flowers, also known as the goddess of spring tends lovingly to all the glorious blooms bursting forth, many attracting the butterflies and busy bees that work in perfect unity to collect life's sweet nectar. 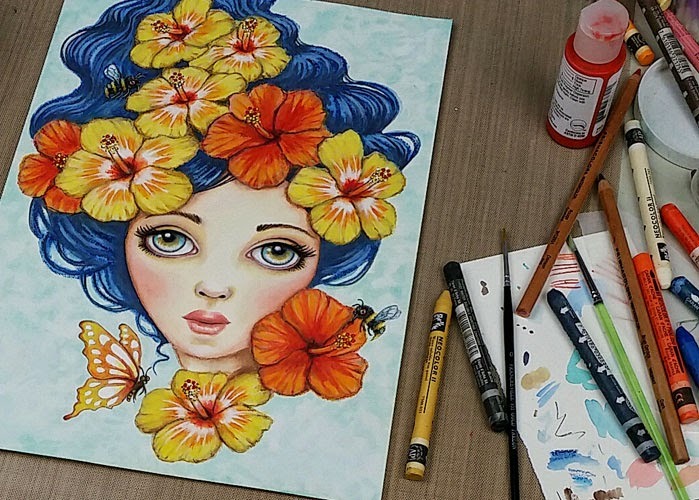 The inspiration behind this artwork is nurturing, growth and transformation. 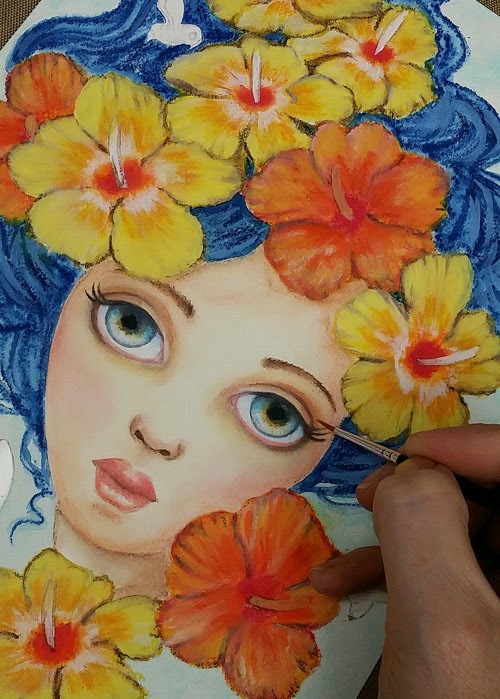 I started "Flora" the ancient Roman goddess of plants and flowers after a trip home to Ireland to meet our first granddaughter. For some reason I decided not to go any further than the base colours. As part of my commitment to myself this year, I promised to revisit unfinished pieces of my artwork and breathe new life back into them. 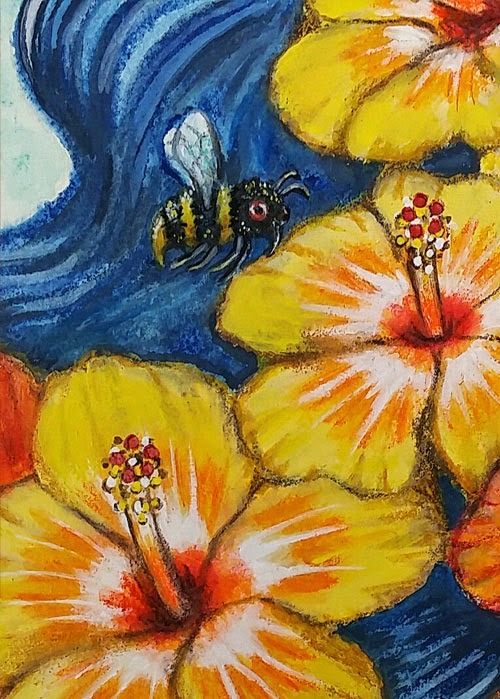 I chose the bright colours of the hibiscus flowers for their symbolism of joy, happiness and welcoming life into the world. 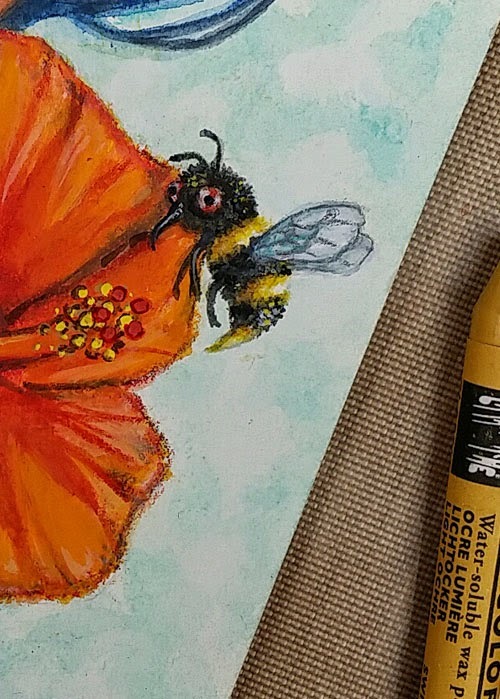 I took artistic licence with the look of the bees, however they still represent family, hard work and coming together. 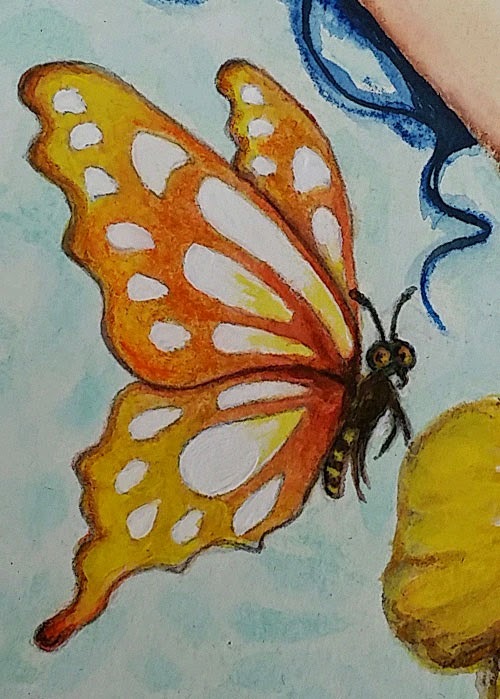 The butterfly, one of my favourites stand for change and new possibilities. 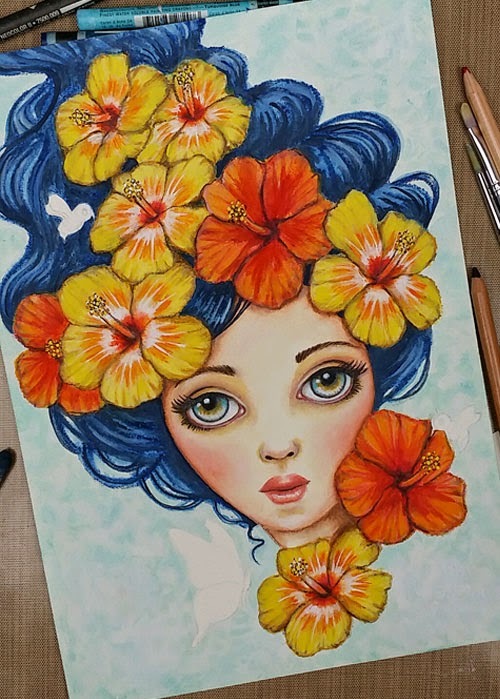 Acrylics, caran d'ache and watercolour pencils were used. This piece is a reminder that no matter where I am, the beauty and miracle of nature is never far away. With our ever growing world, we all have a part to play to protect our natural planet for future generations to enjoy.